This got me thinking – how many of us lose sight of doing follow up calls regularly because we get distracted by other stuff and then sugar-coat the call later by calling it a ‘courtesy call’? To me this follow up call is nearly three years too late – so I’m certainly not satisfied! How many of us realise how unloved we make clients feel when after months, even years we choose to get back in touch with no real explanation of why the calls ceased in the first place but instead launch into trying to ‘sell’ something again? Is it any surprise the contact you used to speak to regularly sounds distant, uncomfortable and keen to get off the phone as soon as possible? They feel like I did. Undervalued. Used even! 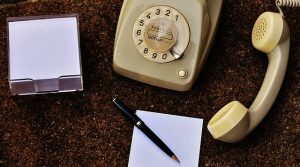 So, why are follow-up calls so critical to your business? 1. It shows you want to maintain relationships with existing customers and start to build a relationship with new prospects. 2. It gives you the opportunity to gain more information about the organisation every time you speak, which can then be used to understand how you can help the organisation going forward. 3. It builds your personal brand which in turn raises awareness, helps them remember you and your company, which ultimately helps build credibility and slowly create trust. 4. It demonstrates how great you are at customer service. Fail to phone someone back when you say you will, it then gives them a snapshot of what your company’s service might be like going forward. You never get a second chance to make a first impression nowadays. 5. In the instance that the customer or prospect has no requirements, the follow up call is an opportunity to review what’s happened since you last phoned and shows someone who is looking to build a ‘long term’ relationship instead of someone just aiming for a quick sell or a positive outcome NOW. So, the next time you contact a customer or prospect, make it part of the process to plan your next telephone call and get back in touch with them when you say you will. Get permission to keep in contact if required – remember contact doesn’t necessarily have to be on the phone all the time. Just ensure they don’t forget you, so when they eventually have a requirement it will be YOU they come to.